In particle physics, quantum field theories such as the Standard Model describe nature in terms of fields. Each field has a complementary description as the set of particles of a particular type. A force between two particles can be described either as the action of a force field generated by one particle on the other, or in terms of the exchange of virtual force carrier particles between them. Gluons, excitations of the strong gauge field. Photons, W bosons, and Z bosons, excitations of the electroweak gauge fields. Higgs bosons, excitations of one component of the Higgs field, which gives mass to fundamental particles. Several types of fermions, described as excitations of fermionic fields. In addition, composite particles such as mesons can be described as excitations of an effective field. Gravity is not a part of the Standard Model, but it is thought that there may be particles called gravitons which are the excitations of gravitational waves. The status of this particle is still tentative, because the theory is incomplete and because the interactions of single gravitons may be too weak to be detected. When one particle scatters off another, altering its trajectory, there are two ways to think about the process. In the field picture, we imagine that the field generated by one particle caused a force on the other. Alternatively, we can imagine one particle emitting a virtual particle which is absorbed by the other. The virtual particle transfers momentum from one particle to the other. 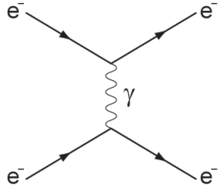 This particle viewpoint is especially helpful when there are a large number of complicated quantum corrections to the calculation since these corrections can be visualized as Feynman diagrams containing additional virtual particles. The description of forces in terms of virtual particles is limited by the applicability of the perturbation theory from which it is derived. In certain situations, such as low-energy QCD and the description of bound states, perturbation theory breaks down. The electromagnetic force can be described by the exchange of virtual photons. The nuclear force binding protons and neutrons can be described by an effective field of which mesons are the excitations. At sufficiently large energies, the strong interaction between quarks can be described by the exchange of virtual gluons. Beta decay is an example of an interaction due to the exchange of a W boson, but not an example of a force. Gravitation may be due to the exchange of virtual gravitons. The concept of messenger particles dates back to the 18th century when the French physicist Charles Coulomb showed that the electrostatic force between electrically charged objects follows a law similar to Newton's Law of Gravitation. In time, this relationship became known as Coulomb's law. By 1862, Hermann von Helmholtz had described a ray of light as the "quickest of all the messengers". In 1905, Albert Einstein proposed the existence of a light-particle in answer to the question: "what are light quanta?" In 1923, at the Washington University in St. Louis, Arthur Holly Compton demonstrated an effect now known as Compton scattering. This effect is only explainable if light can behave as a stream of particles and it convinced the physics community of the existence of Einstein's light-particle. Lastly, in 1926, one year before the theory of quantum mechanics was published, Gilbert N. Lewis introduced the term "photon", which soon became the name for Einstein’s light particle. From there, the concept of messenger particles developed further. ^ Steven Weinberg, Dreams of a Final Theory, Hutchinson, 1993. ^ Rothman, Tony; Stephen Boughn (November 2006). "Can Gravitons be Detected?". Foundations of Physics. 36 (12): 1801–1825. arXiv:gr-qc/0601043. Bibcode:2006FoPh...36.1801R. doi:10.1007/s10701-006-9081-9.